Q: I just read your interview in USA Today. How did you manage to pay off $100,000 in credit card debt in only three years? I owe close to $35,000 and feel stressed and overwhelmed. I’d appreciate any advice you can give me. Thanks! A: Thanks for reaching out, and I’m sorry to hear about your stress concerning your debts. I know what that’s like — but I also know how good it feels to get to the other side. And trust me: it is doable! Right now, you’re probably overwhelmed because you don’t have a debt-elimination plan and you may feel like you’re living paycheck to paycheck too. (It certainly doesn’t help your mental outlook when it seems like your money has to go out every month to pay bills just as quickly as that cash came in). In any event, I wanted to answer your question about how I got out of debt, and also give you a bit of hope and inspiration that you can conquer your $35,000 in debt too. 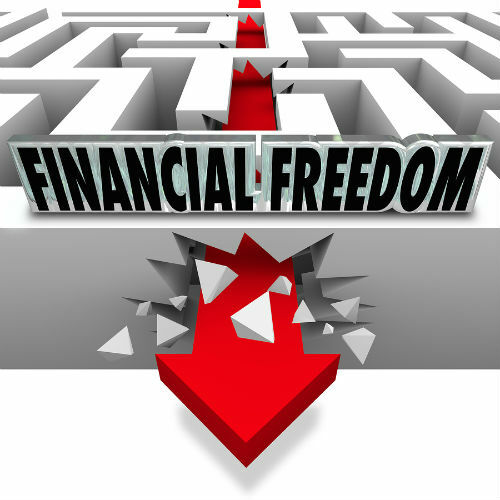 In a nutshell, I employed a variety of strategies to become debt free. I didn’t start out with an organized game plan. I just did a number of techniques to give myself some initial relief — and then I ultimately combined those methods with other more strategic options. So many people “estimate” or “guesstimate” about how much credit card debt they’re carrying — mainly because they don’t want to have to face the financial truth of their situation. When I actually wrote down EXACTLY how much I owed, it was part of my economic wake-up call. Sounds obvious enough, right? Well, unfortunately, most people deep in debt because of spending issues (as was the case for me) keep repeating the same behaviors that got them into debt in the first place. Once I resolved to stop overspending, and stuck to it, I was able to more quickly clear away my obligations and not burden myself by adding to or prolonging the problem. I paid off every dollar that I owed – and then some (counting interest, of course) — but I was able to knock down my interest rates dramatically, largely because I’d never missed any payments. So I called up my creditors and got lower rates. After negotiating, all of my credit card interest rates were 4.9% and lower; some were at 2.9%; others were even 0% deals (I did balance transfer offers and got 0% teaser rates when creditors wouldn’t budge and lower my rates). As I explained in that USA TODAY interview and podcast, making minimum payments is a surefire way to stay mired in debt, year after year. In my case, I began doubling and tripling my minimum payments and it made a world of difference. Back when I was deep in debt, I had a car loan with an above-market interest rate. I refinanced my auto loan and saved a couple hundred dollars per month. Then I used the savings to more aggressively pay off my credit card bills. We all get financial windfalls. I’m not talking about winning the lottery. I mean more common windfalls like a year-end bonus, a tax refund check, birthday money, holiday gift funds from a grandparent/parent, etc. Anytime I came into extra cash like the sources of money mentioned above, I used to for debt elimination. In fact, after I’d paid off about $70,000 worth of my debt using the techniques mentioned above, my ex-husband and I sold some land we owned. Then we took $30,000 in proceeds and paid off the last of the credit card bills. I was raised to believe that, next to love, education was the most important thing you could give a child. So even though I couldn’t afford it, I sacrificed when my kids were much younger and I sent them to an expensive private school. (I’m talking $20K each when my older two children were just 5 and 3 years old). I wanted to provide them with a great educational head start in life and when I couldn’t pay for their education with cash, what did I do? I used my credit card advance checks. Again, long story short, I ultimately decided (for financial and personal reasons) to take my kids out of private school and stop driving myself deeper into debt. Thank God, my kids did well in public school and continue to thrive academically. By the way, my oldest daughter, who’s now 17 and is a senior in high school, was just named a National Merit scholar, so I know she’s no worse for the wear in public school. In my book Zero Debt: The Ultimate Guide to Financial Freedom, I outline 30 strategies to get out of debt, including the ones I just mentioned. 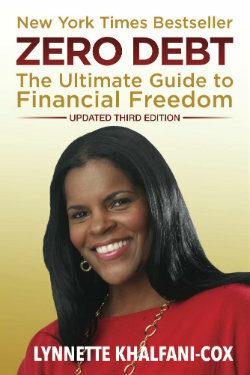 Zero Debt is written as a 30-day action plan … you simply do one strategy one day at a time. I wrote it that way for people just like you who are overwhelmed and just need some guidance about how to begin chipping away at their debts, and then how to stay on the path until they ultimately become debt free.